SmartCollect121 is a world class debt collection management, recoveries and credit reporting solution designed to empower financial institutions to manage their debt efficiently and effectively . From its inception, SmartCollect121 has been designed and developed as an end-to-end debt management and recovery software application at the heart of cost efficiency, workflow management, compliance, collections and recoveries productivity. The system design is based on simplicity, workflow efficiency, information availability and operator effectiveness. In comparison to other available debt collection systems, further measures have been taken in order to better understand the business processes, regulatory framework, debtor profiles and reporting requirements. 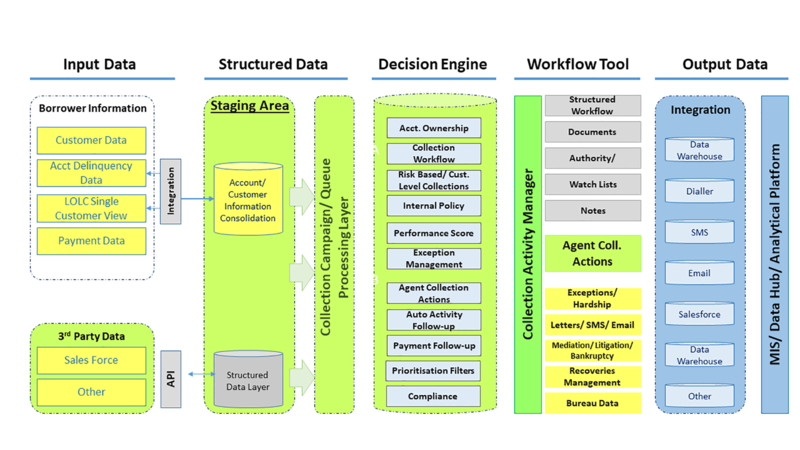 Flexibility to implement and rapidly change strategies to address unique business requirements regardless of the level of complexity..
Ability to have a complete view of the customer or account through integrated collections, recovery, litigation and agency management. Full audit trail of all collection/recovery activities. 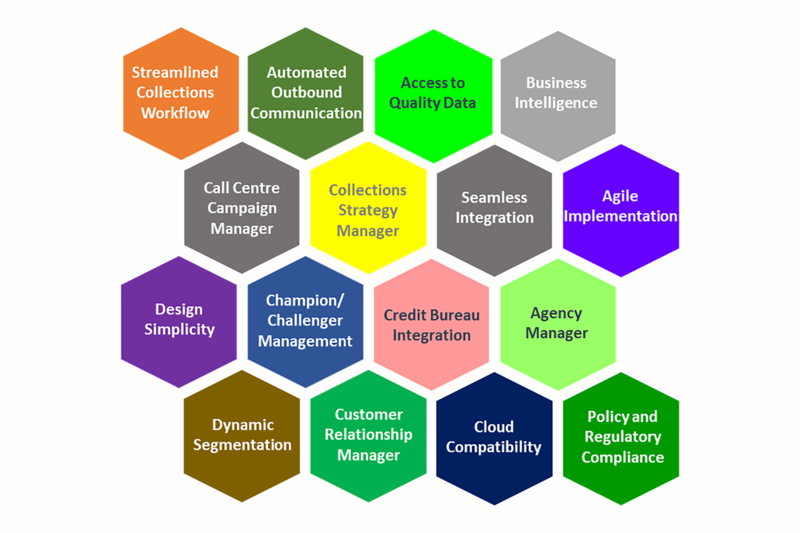 SmartCollect121 is a highly customisable, modular solution that can integrated with a wide range of client systems and data sources. An agile implementation model enables SmartCollect121 to achieve a much quicker return on investment through earlier and faster collection of the outstanding debt. SmartCollect121's architecture ensures full and seamless integration with all other IT systems applicable to the collections process, including: core banking. including billing systems, CRM/ customer information systems, mail houses, messaging systems, provisioning systems debt recovery agencies, credit bureaus and third party analytics engines. 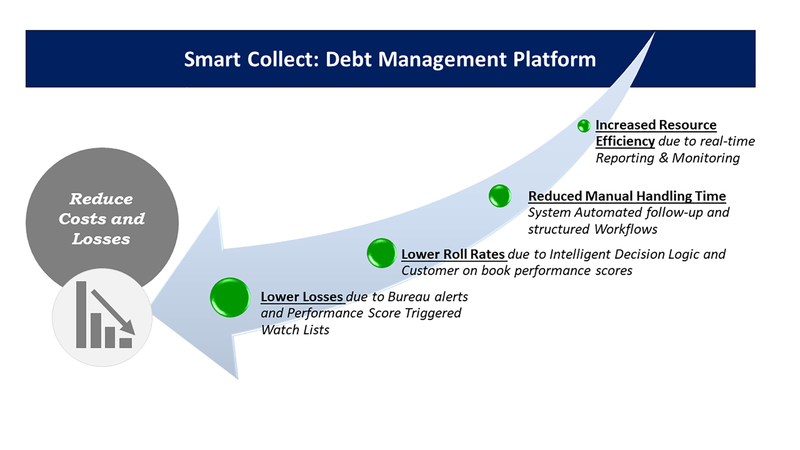 SmartCollect121 is a highly sophisticated debt management decision engine in the financial services sector and the system�s effective functionality makes it irreplaceable for organisational debt management. 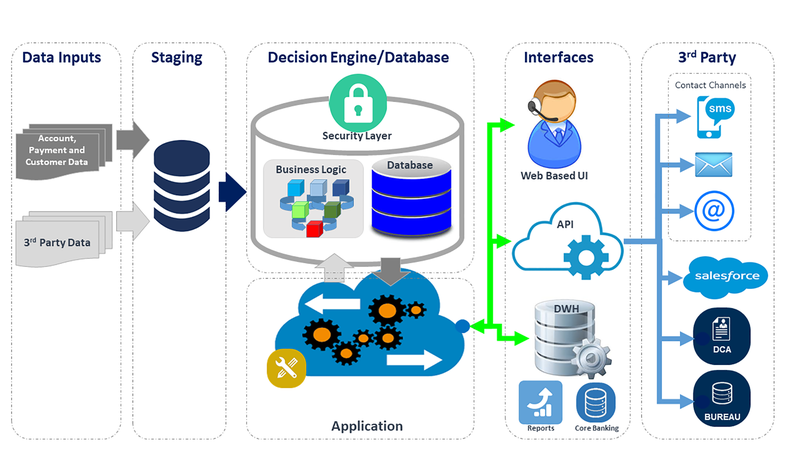 Seamless Integration : Its software architecture ensures full and seamless integration with all other IT systems applicable to the collections process, including core banking, data warehousing, API's, CRM/customer information systems, document management systems, messaging systems, mail houses, provisioning systems and third party analytics engines. Dynamic Segmentation : Dynamic segmentation SmartCollect121 can segment customers into highly specific customer types according to a wide range of variables, to provide greater flexibility in managing customers and to assign accurate collections priority. Apply business intelligence : The system has in-built advanced business intelligence functionality, enabling managers, team leaders and system administrators to monitor the effectiveness of the collections system, agents and to highlight areas that are performing well, while identifying those areas that require further enhancement. 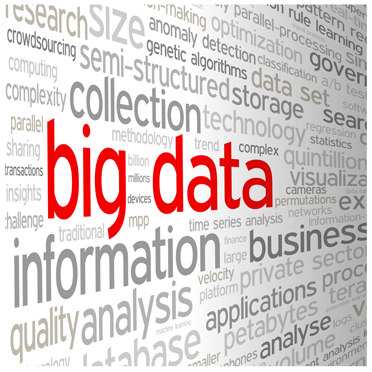 Data Quality : Increase quality of data using business rules and data capture smart logic. Champion/Challenger : Collections Managers can change strategies easily using Champion/ Challenger and filtering tools to test new strategies against tried and tested strategies. Faster Implementation : An agile implementation model enables SmartCollect121 to achieve a quicker return on investment through earlier and faster collection of the outstanding debt. Bureau Integration : Ability to manage all credit bureau reporting requirements as well as capability to interact with bureau at a customer level and deliver credit alerts. Customer CRM : Has the ability to keep customer contact information up-to-date via the SMS return and mail return smarts. With all capital expenditure under intense scrutiny, the system selection criteria now more than ever needs to focus on overall cost of ownership and return on investment to the business. Software solution selection can be a torturous process. As well as the standard price/ feature comparison, the evaluation of numerous criteria such as technology platform, system architecture, service and support and even corporate vision has become an integral part of the selection process. However, in this environment of escalating losses, priority must be placed on those areas that will count most. Four key collections system attributes have emerged as having the greatest impact on a company's bottom line. SmartCollect121 is designed to operate as an independent system within the institutions firewall.